Screen Grab: [Your Company Name] Network Map. (Example) Embed in your website to help generate leads to refer to other Pros | And, to let your clients and prospects know that you can help them - anywhere. 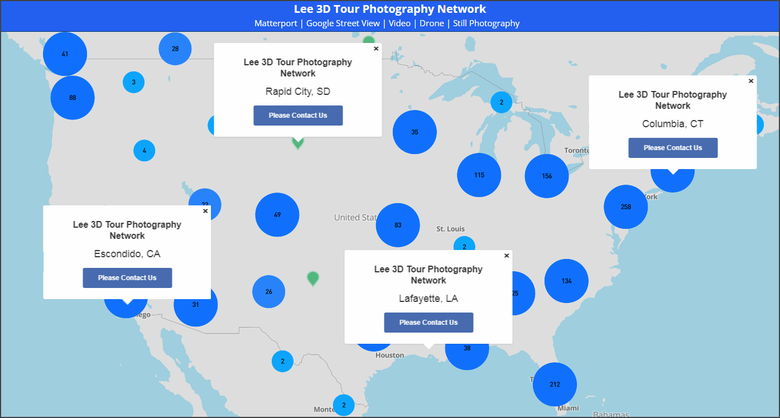 Why would you want to generate inbound leads for Matterport Pros in other locations? Because you could refer the lead and get paid. Option 1: [$50] if the lead turns into business for you. Option 2: [10 percent] if the lead turns into business for you. Option 3: [5 percent] for 12 months if the lead turns into business for you. Yes. It's the honor system that the Pro will send you a PayPal payment or check. I could imagine that for some Matterport Service Providers in the We Get Around Network Forum Community, providing referrals could turn into a bigger business than scanning in their Market. You may have already scanned for another Matterport Pro, so you already have some experience with a Matterport Pro that and makes the difference between what you charge and what the Pro charges his/her client. So, asking for a referral fee works the same way. If you ever had an in-bound lead that was not in your location, what did you do? Give money away, or make money by letting the client know that you can referral the lead to a Member of YOUR Network! If you never thought of doing this, imagine your trusted clients. Make it obvious that you offer Matterport referrals anywhere to help your clients – and prospects – know this. What questions do you have about getting started scaling your business by offering referrals for Matterport Pros anywhere? P.S. Not yet a We Get Around Network Basic, Standard or Premium Member? The [Your Business Name] Network Map is one of around 40 Membership Benefits. Are you generating in-bound leads for other markets? Above is an example of how you can make money with these leads.